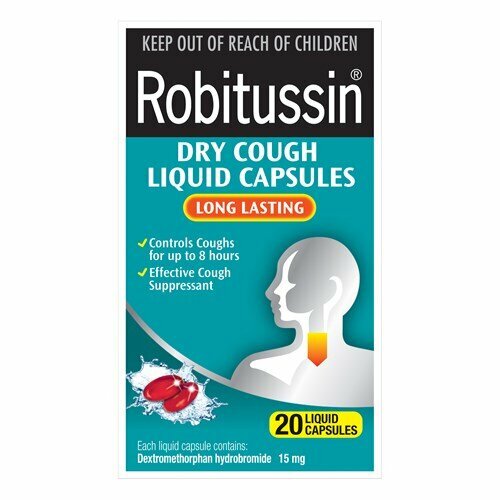 Dry cough is very annoying, but taking Robitussin one may get rid of it within a couple of days. The drug contains two active ingredients. The first one is Dextromethorphan, which helps to suppress the urge to cough. The second one is called Guaifenesin. It works as an expectorant, thus induces thinning and loosening of the mucus and helps to get rid of chest congestion. As a result, it makes breathing easier. Why and in what doses can this drug be used? Robitussin is recommended to the patients suffering from acute bronchitis, common cold accompanied by cough, and a number of other diseases of the upper and lower breathing system. The drug may be taken regardless of foods. When using Robitussin, nausea is quite common. That’s why you’d better administer the medication with a meal. The medication is manufactured in three forms so that every patient can use the one, which is most convenient to him. You may find on the shelves of the drugstore Robitussin in the form of capsules, liquid or powder. Capsules may be used by adults and people suffering from diabetes as they don’t contain sugar. They taste bitter so it’s better to take them whole, without chewing or crushing. Take it every 4 hours with a glass of water. A liquid form of Robitussin is advised to children and adults having difficulties with swallowing. This form of the remedy has alcohol and sugar in its composition so keep it in mind in case you want to avoid taking these substances. Robitussin liquid may be used up to 4 times a day with an interval of 6-8 hours. Take 10mL of the liquid (2 spoons). The dosage of the preparation depends on what your doctor has prescribed to you. The common dosage is 15mg/100mg, yet Robitussin maximum strength is 15mg/200mg. Robitussin in the form of a powder is sold in packets. They are convenient to use; besides, you can use it either dissolving in a glass of water or administering the powder. Just open the packet and take all its contents. Except for the different medical forms and strengths, you can also find Robitussin for using in the daytime and nighttime. Differences in formulas let the patients diminish the symptoms, which seem most annoying at a definite time of the day. What is Robitussin dosing regimen in children? Only some forms of the drug may be applied in children younger than 12. Here belongs extended release powder, which may be given to the kids since the age of 4. The common dosing regimen for children aged 4-6 years is 2.5mL every 12 hours. 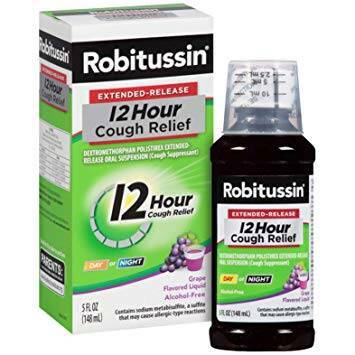 Those who are 6-12 years old should administer 5mL of Robitussin once in 12 hours. Patients aged 12 and more are recommended to take the same dose as adults. Phenylketonuria (a rare hereditary disease). Patients with diabetes should avoid using a liquid form of Robitussin. The same caution should be taken with patients having problems with alcohol consumption as a liquid form of the remedy contains alcohol. When getting the therapy with Robitussin, drink plenty of water. It will help to avoid kidney stones formation, which is one of the possible side effects. The drug is not applied in the therapy of chronic breathing disorders. Robitussin pregnancy use should be discussed with your healthcare provider. It is not clear how the preparation can affect an unborn baby. Hence, all the possible benefits and risks should be taken into account when you decide whether to take the medication or not. Cough, especially at the nighttime can bring a lot of discomfort to an expectant mother. That’s why a doctor can recommend using Robitussin nighttime while pregnant. Stick to all the doctor’s instructions to prevent any undesired effects. For breastfeeding women, the use of the drug is not advisable because it passes into the breastmilk. But if the potential benefits outweigh the possible risks, short-term use of the medication is possible. What adverse reactions are possible when on Robitussin? The bulk of these reactions is only mild, yet they still need a consultation with a specialist. In case you notice that the unwanted effects last for too long or get worse, turn to the nearest hospital. The appearance of severe side effects (like an allergy) needs emergency medical attention.